In the first case of its kind, a Singapore-registered company was prosecuted on Monday for facilitating payment for costs related to the shipment of arms and related material bound for North Korea from Cuba. Chinpo Shipping Company is alleged to have transferred US$72,017 from its Bank of China account to that of a shipping agent in Panama – C.B. Fenton and Co – on July 8, 2013. Under the United Nations (Democratic People’s Republic of Korea) Regulations 2010, it is an offence to transfer financial assets that could help North Korea in its nuclear and ballistic programmes, or efforts to produce other weapons of mass destruction. Chinpo, whose representative is Mr Tan Cheng Hoe, 82, a director of the company, also faces a second charge of carrying on a remittance business without a valid licence between April 2, 2009 and July 3, 2013 . The court heard that a North Korean Cuba-bound cargo ship, the Chong Chon Gang, docked in Mariel, Cuba, on June 20, 2013, and loaded 25 containers and six trailers of arms and related material weighing 474 tons. This included two MiG-21 jet fighters, anti-tank rockets and SA-2 and SA-3 Russian surface-to-air missile systems and their parts. All were bound for North Korea and hidden in the cargo hold under 10,500 metric tons of sugar, said the prosecution in its opening statement. The company that managed the ship, Ocean Maritime Management (OMM), wanted someone to make payments for them to hide the fact that the money was coming from a DPRK entity. Chinpo stepped in to help. On May 28 that year, it transferred US$54,270 to pay for the passage of Chong Chon Gang to and from Cuba through the Panama Canal. Another payment of US$72,017 was made on July 8 that year. Deputy Public Prosecutor Sandy Baggett said that was not the first time Chinpo had transferred money for North Korean companies or OMM. For at least four years, Chinpo remitted a total of over US$40 million without a licence and without regulation by the Monetary Authority of Singapore. MAS requires companies to exercise due diligence when dealing with customers and to guard against money laundering. Mr Edmond Pereria is defending the company, which can be fined up to $1 million if convicted under the UN Act. The penalty for operating a remittance business without a licence is a $100,000 fine. A joint Ministry of Foreign Affairs and Ministry of Home Affairs statement last week said Singapore takes a serious view of its obligations to prevent the illicit trafficking of weapons of mass destruction, their means of delivery and related materials. “We will not hesitate to take action against individuals and/or companies that fail to comply with the relevant Singapore legislation that we have put in place to give effect to measures prescribed by United Nations Security Council regulations,” it said. A Singapore shipping firm blacklisted by the United States government for allegedly supporting illicit arms shipments into North Korea strongly denied the allegation Friday (July 24) and vowed to clear its name. The U.S. imposed sanctions on Thursday against a Singaporean company and its president for their links to a North Korean shipping firm that allegedly helped an attempt to move weapons from Cuba to Pyongyang. Senat Shipping Ltd., the U.S. Department of Treasury said, helped arrange the purchase, repair, certification and crewing of vessels belonging to North Korea’s Ocean Maritime Management Co., which the U.S. targeted last year with sanctions for allegedly managing a vessel sailing from Cuba to Pyongyang that carried illicit cargo falsely declared to be sugar and spare plastic. The vessel was interdicted by Panama in July 2013 on suspicion of moving drugs; it was freed in February 2014 to sail back to Cuba after Pyongyang paid a fine. “Arms shipments transported by OMMC serve as a key resource for North Korea’s ongoing proliferation activities. Sales from these shipments contribute to North Korea’s other illicit programs,” said Adam Szubin, acting undersecretary of Treasury for terrorism and financial intelligence, in a statement. Leonard Lai, president of Senat, was also targeted Thursday with sanctions, as was the vessel “Dawnlight,” which Treasury identified as blocked property of Senat. Neither Senat nor Mr. Lai could be reached. Treasury also said Thursday it updated its sanctions designation on OMMC, saying the company has continued to operate through multiple front companies and representative offices to evade sanctions. It also updated its listings on two officials who work for Tanchon Commercial Bank under aliases. LAI, Leonard (a.k.a. LAI, Yong Chian); DOB 16 Jun 1958; Passport E3251534E (Singapore) expires 20 Mar 2018 (individual) [DPRK]. SENAT SHIPPING LIMITED (a.k.a. SENAT SHIPPING & TRADING PTE LTD; a.k.a. SENAT SHIPPING AGENCY LTD; a.k.a. SENAT SHIPPING AND TRADING LTD; a.k.a. SENAT SHIPPING AND TRADING PRIVATE LIMITED), 36-02 A, Suntec Tower, 9, Temasek Boulevard, Singapore 038989, Singapore; 9 Temasek Boulevard, 36-02A, Singapore 038989, Singapore; Panama City, Panama; PO Box 957, Offshore Incorporations Centre Road Town, Tortola, Virgin Islands, British; Identification Number IMO 5179245; alt. 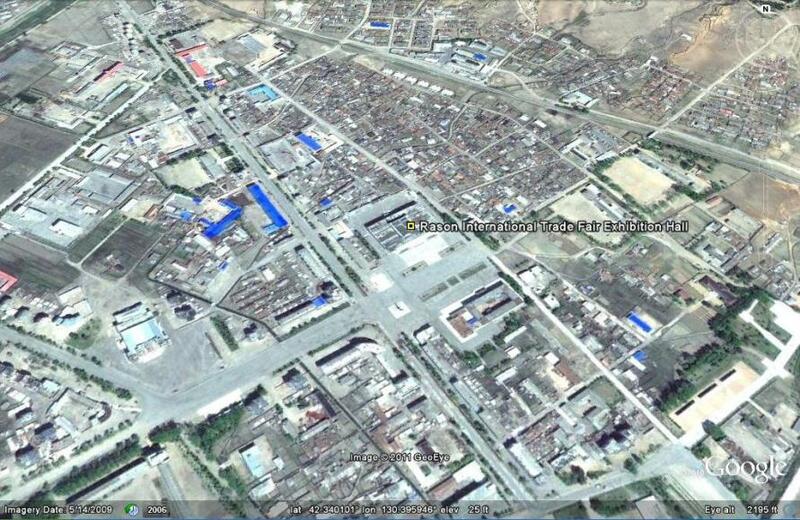 Identification Number IMO 5405737 [DPRK]. DAWNLIGHT General Cargo Mongolia flag; Vessel Registration Identification IMO 9110236 (vessel) [DPRK]. KIM, TONG-MYO’NG (a.k.a. KIM, CHIN-SO’K; a.k.a. KIM, TONG MYONG; a.k.a. 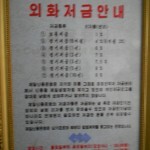 “KIM, JIN SOK”), c/o Tanchon Commercial Bank, Saemul 1-Dong Pyongchon District, Pyongyang, Korea, North; DOB 1964; nationality Korea, North (individual) [NPWMD]. -to- |KIM, Tong-Myo’ng| (|a.k.a. KIM, CHIN-SO’K; a.k.a. KIM, HYOK CHOL; a.k.a. KIM, TONG MYONG; a.k.a. “KIM, JIN SOK”|)|; DOB 1964; alt. DOB 28 Aug 1962; nationality Korea, North; Passport 290320764| (individual) [NPWMD] (|Linked To: TANCHON COMMERCIAL BANK|). OCEAN MARITIME MANAGEMENT COMPANY LIMITED (a.k.a. EAST SEA SHIPPING COMPANY), Dongheung-dong Changgwang Street, Chung-ku, PO Box 125, Pyongyang, Korea, North; Donghung Dong, Central District, PO Box 120, Pyongyang, Korea, North; No. 10, 10th Floor, Unit 1, Wu Wu Lu 32-1, Zhong Shan Qu, Dalian City, Liaoning Province, China; 22 Jin Cheng Jie, Zhong Shan Qu, Dalian City, Liaoning Province, China; 43-39 Lugovaya, Vladivostok, Russia; CPO Box 120, Tonghung-dong, Chung-gu, Pyongyang, Korea, North; Bangkok, Thailand; Lima, Peru; Port Said, Egypt; Singapore; Brazil; Identification Number IMO 1790183 [DPRK]. -to- OCEAN MARITIME MANAGEMENT COMPANY LIMITED (|a.k.a. EAST SEA SHIPPING COMPANY; a.k.a. HAEYANG CREW MANAGEMENT COMPANY; a.k.a. 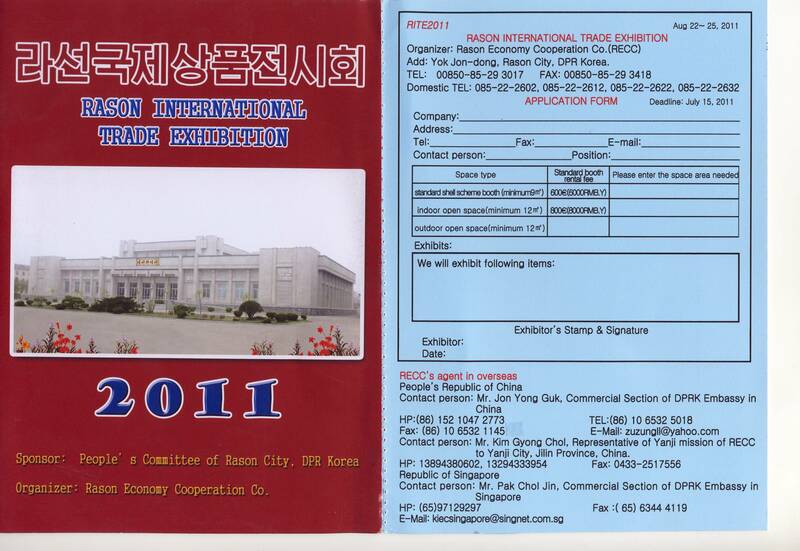 KOREA MIRAE SHIPPING CO. LTD.|)|, Dongheung-dong Changgwang Street, Chung-ku, PO Box 125, Pyongyang, Korea, North; Donghung Dong, Central District, PO Box 120, Pyongyang, Korea, North; No. 10, 10th Floor, Unit 1, Wu Wu Lu 32-1, Zhong Shan Qu, Dalian City, Liaoning Province, China; 22 Jin Cheng Jie, Zhong Shan Qu, Dalian City, Liaoning Province, China; 43-39 Lugovaya, Vladivostok, Russia; CPO Box 120, Tonghung-dong, Chung-gu, Pyongyang, Korea, North; Bangkok, Thailand; Lima, Peru; Port Said, Egypt; Singapore; Brazil; Hong Kong, China; Shenzhen, China; Identification Number IMO 1790183| [DPRK]. RA, Kyong-Su, Beijing, China; Tanchon Commercial Bank Representative to Beijing, China (individual) [NPWMD]. -to- RA, Kyong-Su (|a.k.a. CHANG, MYONG HO; a.k.a. CHANG, MYO’NG-HO; a.k.a. CHANG, MYONG-HO|), Beijing, China; Tanchon Commercial Bank Representative to Beijing, China (individual) [NPWMD] (|Linked To: TANCHON COMMERCIAL BANK|). Here is additional coverage in The Guardian, and Channel News Asia. angladesh has expelled a North Korea diplomat caught trying to smuggle 27kg (59lb) of gold into the country. Son Young-nam, the first secretary of North Korea’s Dhaka embassy, was stopped as he arrived in Bangladesh via Singapore on Friday. He was released and has not been charged, according to diplomatic protocol, but customs officials said it was a “clear case of smuggling”. Sanctions against North Korea tightly restrict the movement of money. Mr Son’s bag, which he had refused to allow customs officials to inspect, was found to contain gold bars and ornaments worth about US$1.6m (£1m). North Korea’s ambassador, Ri Song-hyon, was summoned to the foreign ministry on Monday and told to send Mr Son home. “We told the ambassador to prosecute him in North Korea and update us about the action to be taken against him,” Mohammad Shahidul Haque, the ministry secretary, told Reuters. Mr Son was reported to have left Bangladesh on Monday night. Official figures show customs officers have seized nearly 1,000kg (2,200lbs) of gold in the past 22 months at Bangladesh’s two international airports. Sales of gold have long been an important source of funds for the North Korean regime, which has been largely cut off from the global financial system by sanctions imposed to curb its nuclear-weapons program. Kim Kwang-jin, a former banker for the Pyongyang regime, said North Korea could have been moving the precious metal in an effort to find buyers. Bangladeshi police officials said they are also investigating whether Mr. Son was acting as a courier by a local smuggling ring. Bangladesh has become a transit point for illicit gold shipments bound for India, which has raised import duties on the metal. Calls to the North Korean embassy in Dhaka went unanswered on Friday and Saturday, the weekend in Muslim majority Bangladesh. A man who answered the phone at the North Korean embassy in Singapore and declined to give his name said he had “no idea” about the gold shipment and hadn’t heard of Mr. Son. Bangladeshi airport officials said Mr. Son told them he had been given the bag with the gold by a man in Singapore whom he declined to identify. Mr. Son said he was to deliver it to “a friend” of the man in Dhaka, the officials said. A police official said four North Korean diplomats came to the airport seeking Mr. Son’s release. Gold smuggling through the Dhaka airport has risen sharply in recent months, with large quantities seized. In February, officials discovered 61 kilograms of gold in the toilet of a Bangladeshi aircraft. Mr. Kim, the former Pyongyang banker, who defected while based in Singapore in 2003, said that North Korea may have moved the gold to Bangladesh for sale after running into problems selling it in Singapore. North Korea has previously sold gold bullion in the Singapore market, he said. But tighter restrictions imposed by the city-state on sales of precious metals, stones and other valuable items last year have made it harder. Singapore’s new rules, intended to combat money laundering and terrorism financing, require dealers to submit a report to the government for any cash transaction valued over about $14,000. Gold sales help provide funds used by North Korean leaders to ensure the loyalty of senior officials by providing them with a comfortable lifestyle, according to high-level defectors. Choi Kun-chol, a former senior North Korean official who worked at the state’s main gold-trading business, told the Journal last year that sales of gold from North Korean mines has fallen from a peak of around 10 tons in the late 1980s to around four tons in more recent years. North Korea often uses diplomats to carry cash and other valuables, defectors and diplomats say. Increased sanctions and scrutiny of official bank accounts have increased the need for secret movement of items in this way, they say. 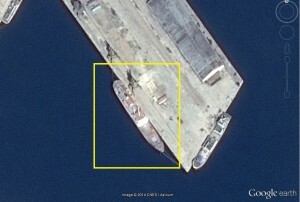 Pictured Above (Google Earth): The location of the Singaporean ship “Royale Star” at Rason Port (in Yellow). A departure ceremony of tour boat Royale Star for the first batch of Rason-Mt. Kumgang international tour makers took place at Rajin Port Saturday. 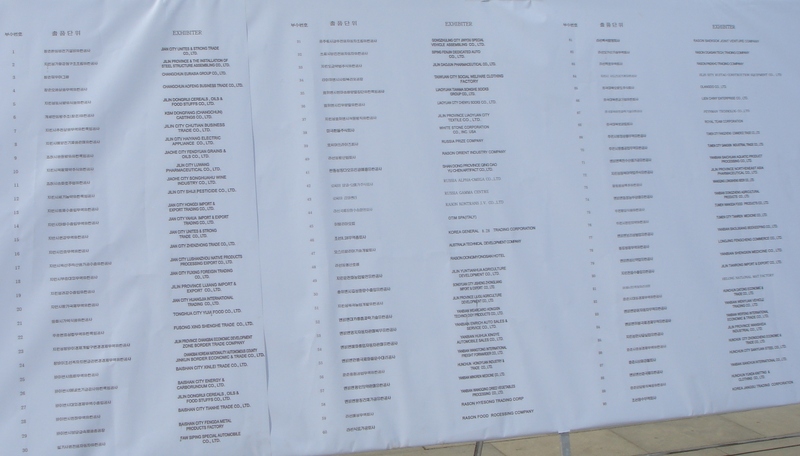 Present there were officials and other personages of the DPRK and Chinese institutions related to tourism, tourists and people in Rason City. Jon Tong Chol, director of the Rason City Tourist Administration Bureau, and Zheng Yuanhui, owner of the boat, made speeches there. The speakers congratulated the guests on having an opportunity to tour Mt. Kumgang, world famous mountain and a superb scenic beauty, as the first batch of makers of Rason-Mt. Kumgang international tour by the boat. They wished the guests pleasant and happy days. At the end of the ceremony the boat left the port. Beijing-based Young Pioneer Tours said Pyongyang has authorized seven, four-day tours to the port and resort on its east coast from late April though mid October. The Royale Star, a small cruise ship owned by a Singaporean shipping company, will be used to ferry foreign tourists, with the company claiming passengers will get a chance to see unique marine vistas off Rajin and Mount Kumgang, one of the top natural tourist destinations in North Korea. The vessel is 138-meters-long, has a beam of 28 meters and is able to carry a large number of passengers and crew. The ship has a duty-free shop, hair salon, bar, rest areas and a restaurant-theater. North Korea is recently expanding its tourism industry, one of its major foreign currency earners. North Korea is improving its tourism infrastructure to attract more foreign tourists, and recently introduced a new cruise ship to bring in tourists from China and other countries. Workers’ Party of Korea’s mouthpiece Rodong Sinmun reported on February 21 that an opening ceremony for a Singapore cruise ship called the Royale Star was held at Rajin Port. The Rajin Port staff and government officials in the tourism sector from North Korea and China were in attendance. The new cruise ship is expected to revitalize the tourism in Rason and Mount Kumgang and the Rason Economic and Trade Zone. Royale Star is expected to attract a large number of Chinese tourists.Although further details were not specified, Royale Star is also likely to travel between Rajin Port and Mount Kumgang in the Gangwon [Kangwon] Province, given the emphasis placed on Rajin-Mount Kumgang tours. 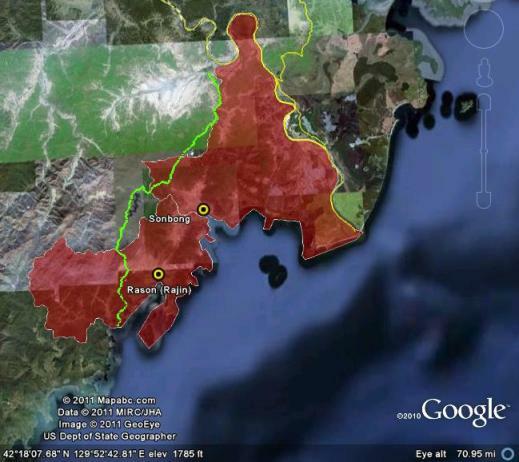 After a South Korean tourist was shot by a North Korean soldier at Mount Kumgang in July 2008, South Korean tours to the mountain resort came to a halt. Since then, North Korea has turned its attention to attracting Chinese and other foreign tourists. In August 2011, North Korea resumed operation of the Mangyongbong cruise ship (which was used to repatriate ethnic Koreans in Japan to North Korea in the late 1950s) as a pilot test for the operation of marine tourism to Rajin and Kumgang. However, the pilot tour was rated poor due to the cruise ship’s old and substandard facilities. Passengers on the Mangyongbongfor the tour included foreign journalists from China, Russia, and the United States, and Chinese businessman. The ship set sail four times in 2011 from August to October. Four hundred Chinese tourists were said to have taken the tour. However, the cruise failed to attract tourists to operate on a regular basis. North Korea explored the use of other luxury cruise ships from Hong Kong, as reported by Chinese media last year. North Korean authorities and Chinese travel agents seemingly came to the conclusion that cruise facilities and services must be drastically improved in order to attract more customers,and this has likely led to the recent introduction of the Singaporean cruise ship, Royale Star. Royale Star is 138m in length and 28m in width, comprising a total of eight floors, and is supposedly equipped with a variety of facilities and services, including luxury rooms and bars, duty-free shops, a hair salon, lounge, and dining halls with live performances.A crew of more than 150 people was hired, including nationals from Singapore, Malaysia, India, Myanmar, Cambodia, Russia, Ukraine, and North Korea. 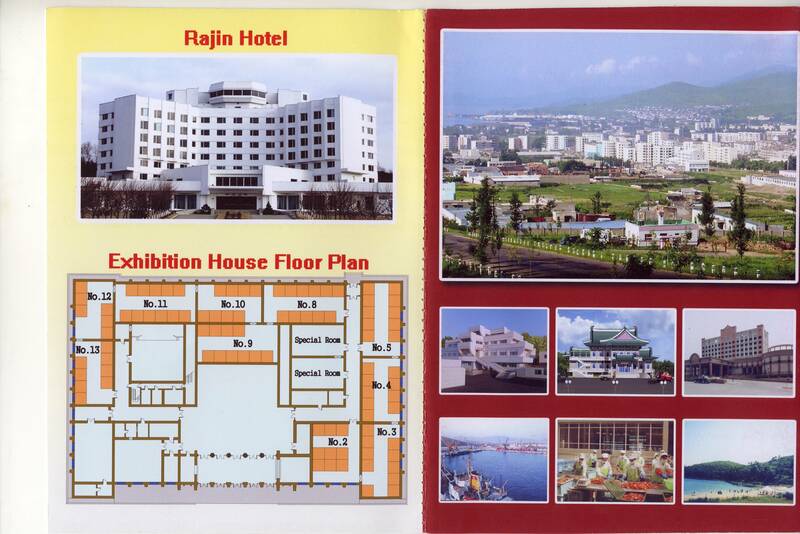 Authorities also plan to open a hotel in Rajin Port to address the current lodging shortages in the Rason Special Economic Zone, which is under joint North Korea-China development. Last year about 600 to 700 Chinese visited the area during the peak season for tourism and business purposes,but reported to have experienced great difficulty finding accommodations. 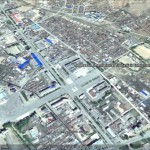 As tourism to North Korea is gaining popularity in China, additional tours to Pyongyang, Kaesong, Panmunjeom, and Mount Kumgang are being considered, and new tourism infrastructure is being constructed in the border cities of Dongrim [Tongrim] (North Phyongan Province) and Kyongsong (North Hamgyong Province). Pyongyang, February 20 (KCNA) — The Singaporean tourist ship “Royale Star” opened its business with due ceremony at Rajin Port in the northeastern DPRK on Feb. 20. 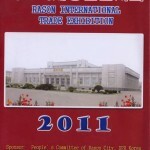 Present at the ceremony were officials and other people of DPRK and Chinese institutions related to tourism and people in Rason City. Kim Chun Hwa, director of the Rason International Travel Company, the director of the Yanbian Tianyu International Travel Company of China, and Zheng Yuanhui, owner of the ship, made speeches at the ceremony. They said the start of business by the ship is of great significance in developing tourism in the Rason Economic and Trade Zone, adding it will contribute to bringing about a turn in the services for tourists. They expressed thanks to the DPRK for its cooperation in the preparations for the start of the ship’s business. They stressed the need to improve the services and inject fresh energy into Rason-Mt. Kumgang tour and the businesses in the zone. At the end of the ceremony its participants toured cabins and other facilities of the ship. A reception and an art performance were given on the same day. 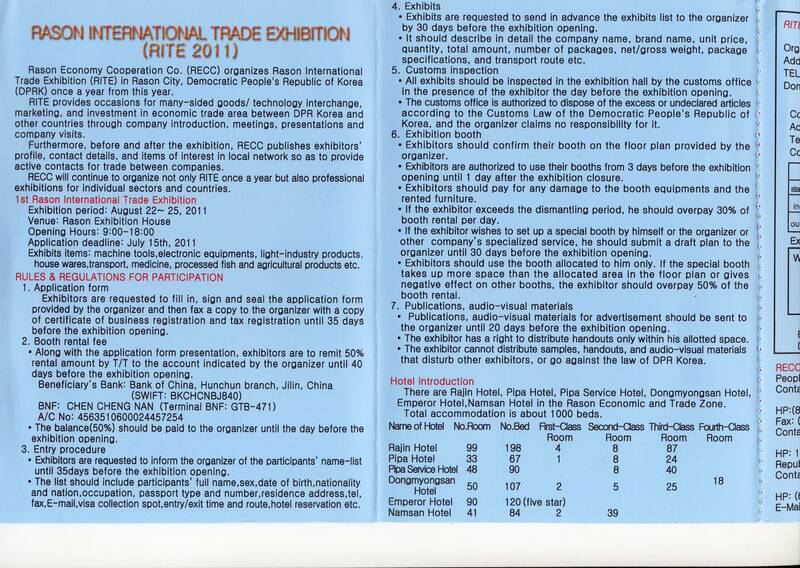 Dr. Seliger has sent in some interesting information on financial products being advertised to North Koreans. I will post it over the next few days. 제일신용은행은 자기의 이름 그대로 경영전략과 자금관리에서 신용을 제일 생명처럼 여기고 있으며 개인저금잔고를 절대로 남에게 보여주거나 알려주지 않습니다. Jeil Credit Bank, as the name of itself, consider credit of management strategies and money management as our life and does not show or share ones account information to others. 제일신용은행의 저금자들은 저금하는 날 혹은 저금 만기 전 임의의 날에 리자를 먼저 찾아 쓸 수 있으며 저금만기날이 아니라도 언제든지 필요하면 저금한 돈을 전부 되찾을 수 있습니다. Jeil credit bank customers can withdrawal the interest before maturity at any time and if needed, all of the money from the savings can be withdrawn before maturity. 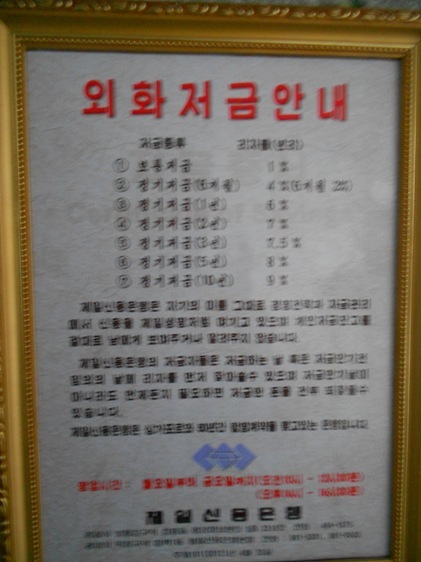 제일신용은행은 싱가포르와 50년간 합영계약을 맺고 있는 은행입니다. Jeil Credit Bank has a 50 years joint venture contract with Singapore. North Korea’s ceremonial head of state Kim Yong-nam visited a foodstuff factory in Singapore on Saturday after talks with the city-state’s parliamentary leader, the North’s official news agency reported. Kim, president of the Presidium of the Supreme People’s Assembly, and his party were briefed on the constant development of the typical foodstuff factory, the (North) Korean Central News Agency (KCNA) said in a brief dispatch from Singapore. Kim and his party also watched a video on the management of the factory before looking around the production processes, it said, adding they also toured Hi-P International Pte Ltd., a manufacturer of electronic products, and a tourist islet. On Friday, the No. 2 leader of the communist state held talks with Michael Palmer, speaker of the parliament of Singapore, according to the KCNA. The North Korean official will also visit Indonesia for talks with President Susilo Bambang Yudhoyono, the agency reported last week. Since the June 8 and 9 groundbreaking ceremonies for joint development projects between North Korea and China were held, attention has been directed toward North Korea’s international economic activities. The Japan-based newspaper, Chosun Shinbo, featured an interview article regarding these collective projects, including the areas of Hwanggumpyong and Wiwha Islands and the Rason Economic and Trade Zone. In addition, it was mentioned that the development of economic zones in Hwanggumpyong and Wiwha Islands will solidify the already strong DPRK-China friendship and expand the boundaries of international economic relations. North Korea is encouraging foreign investments especially in the industrial, agricultural, transportation, construction, financial, and tourism sectors. In particular, adopting state-of-the-art production technology is considered most important. This is to increase the area’s competitiveness in the international market through the production of items that have high export value. However, investment restrictions are placed preventing exports on natural resources like ore and coal. The Committee also stressed the accomplishments of economic cooperation with China and Egypt and revealed plans of passing a double tax avoidance agreement with China, who is the largest foreign investment for North Korea. The Egyptian company Orascom Telecom has invested in telecommunications, construction, and financial sectors in North Korea. The president of Orascom is said to have met with Kim Jong Il early this year, announcing his plans of expanding investment in the country. In addition, the Committee reiterated building an independent national economy does not exclude international economic relations. It explained, “We are trying to resolve our shortcomings through international economic activities while maximizing our domestic technology and resources. This is the principle of socialist economic construction. The Committee of Investment and Joint Venture was established last July, which is a central state organization under the Cabinet overseeing joint ventures and investments. It is in charge of guiding, supervising and administering the inducement of investments from abroad. It is a government body on the level of the Ministry of Trade, which it has close affiliations with. The Ministry is a central organization controlling general trade activities while the Committee is mostly responsible for attracting foreign investment, joint investment, and ventures. Singapore has tightened its trade controls by imposing new prohibitions on transactions with North Korea and Iran. Singapore Customs said in a statement on Friday that the latest regulatory revisions, effective from Nov 1, are timely in the light of ongoing global efforts to curb illicit diversions of controlled goods and technology to rogue entities and sanctioned countries such as North Korea and Iran. Both countries stand accused of trying to start nuclear weapons programmes. At present, prohibitions on them include arms or related materials, certain vacuum systems and pumps, compressors and gas blowers. They also cover luxury goods such as cigars, wines and spirits and even plasma televisions. But in the revised list, there will be new prohibitions on any arms as defined by the United Nations Register of Conventional Arms, and related materials. These include among other things: weaponry, battle tanks, combat aircrafts, warships, armoured combat vehicles. 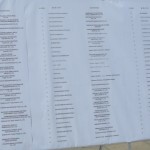 The latest amendments to the list of prohibited imports, exports and goods to or from North Korea and Iran are in line with recent United Nations Security Council Resolutions’ sanctions imposed on the two countries, as well as Singapore’s continuous commitment to its international obligations. Singapore’s trade with North Korea and Iran accounted for less than 0.4 per cent of the Republic’s total trade value of $747 billion last year. The small amount of trade typically revolved around commodities and other agricultural, tobacco and consumer goods. Traders are strongly encouraged to implement effective internal export control compliance measures to screen the consignees and end-users of their exports, Singapore customs said. After relying on its existing laws for more than a year, Singapore is adding more bite to its implementation of United Nations sanctions against North Korea. According to documents on the Government’s electronic gazette website, the Republic is introducing additional legislation to meet its obligations to the resolution adopted in June last year by the UN Security Council (UNSC). From Nov 1, it will be an explicit offence to breach the measures imposed by the UNSC on various individuals, entities and goods and services from the hermit kingdom. The prohibitions will apply to all persons in Singapore and any Singaporean abroad and cover a wide range – from financial and bunkering services to the supply and procurement of certain items. These not only include military-related material but also luxury goods, if it is believed to be in relation to any person who might be involved in North Korea’s weapons programmes. The Singapore Customs website lists 14 categories of luxury goods, such as cigars, wines and spirits, fur products, perfumes and cosmetics, plasma televisions, personal digital music players and luxury cars. Works of art and musical instruments are also included. When the UNSC adopted the resolution last year, Singapore’s Permanent Representative to the UN, Ambassador Vanu Gopala Menon, had informed the council that the city-state had the “necessary legislative framework in place to meet its obligations”. Such laws include the Strategic Goods (Control) Act, the Merchant Shipping Act and the Immigration Act. When contacted, a Ministry of Foreign Affairs spokesperson said the Republic “is obliged to implement the UNSC Resolutions on North Korea. We take these obligations seriously”. But in his letter dated Aug 3 last year, Mr Menon also said that a regulation was being drafted to give effect to the provisions of Resolution 1874 (2009), which had been imposed in response to North Korea’s second nuclear test in May last year. The upcoming legislation comes more than a year after the Monetary Authority of Singapore prohibited financial institutions from carrying on transactions and services with North Korea relating to banned material and listed individuals. Few companies incorporated in Singapore have dealings with North Korea, though. One such company is Maxgro Holdings. According to its website, it is a concession owner and infrastructure development company that holds a 70-per-cent stake in a joint venture with the Pyongyang government to grow eight million hard-wood timber trees on a $23-million, 20,000-hectare plantation near Pyongyang. Other dealings with the Communist state include pharmaceutical and tourism projects. 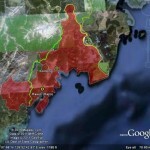 Previous Singapore/DPRK posts can be found here.